Self-Managed Superannuation Funds (SMSFs) are allowed to borrow (refer s67(A) SIS Act), when the ‘single’ asset purchased is held in trust until the loan is repaid by the SMSF, and the asset is then transferred from the trust to the SMSF. A Limited Recourse Borrowing Arrangement (LRBA) is a loan where the security for the loan is limited to the asset being purchased (e.g. residential or commercial property). 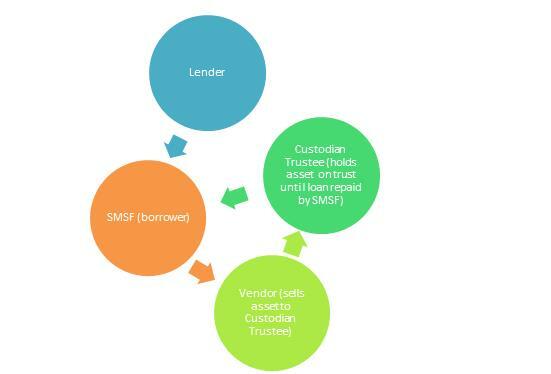 In a basic scenario, there are three entities involved – the Lender, the Custodian Trustee, and the SMSF. There is often confusion about which entity is named on the Contract of Sale, which entity holds the loan and is therefore named on the loan statements, which entity collects the rent and pays the property expenses, and which entity lodges the BAS (if applicable). When the SMSF has decided on the property to purchase (which complies with SIS legislation, the SMSF deed and investment strategy), the SMSF pays the deposit on the property and contracts are signed. As the Custodian Trustee will hold the asset on trust for the SMSF, it is the Custodian Trustee who is entered on the Contract of Sale. The vendor then transfers the ownership of the property to the Custodian Trustee. The SMSF (the borrower) draws on the loan and pays the remainder of the purchase price at settlement. The SMSF should be the entity on the loan statements. The property is then shown as an asset in the financials of the SMSF, i.e. the SMSF balance sheet will show both the property purchased, as an asset and the loan, as a liability. The SMSF will collect the rent on the property, pay the property expenses and lodge the BAS (if registered for GST). Once the loan has been repaid, the Custodian Trustee transfers the title to the SMSF.